Kimura, T. and Takeda, K. (2014). Cellular Translational Reporter Assay. Bio-protocol 4(6): e1068. DOI: 10.21769/BioProtoc.1068. The method described here allows measuring the effect of exogenously introduced modifications to in vitro-transcribed mRNA on the translation in cells. Using cells derived from knockout mice and control littermates, this method enables to compare the results in the presence or absence of specific gene products. In our lab, we used this protocol to check whether the exogenous addition of 5’ capping and 2’-O methylation to in vitro-mRNA affects the translational efficiency. Here we describe the details of our experiments. Note: Nuclease-free Water and LiCl Precipitation Solution are included in the kit. Prepare the polymerase chain reaction mix. Run the polymerase chain reaction. Place the reaction mix to the GeneAmp PCR system 9700. Purification of PCR amplified fragments. Electrophorese the PCR products on 1% of agarose gel. Stain Gel with Ethidium Bromide. Cut the gel region including an amplified DNA fragment (approximately 1.6-kbp). Purify PCR amplified DNA from gels using illustra GFX PCR and Gel Band Purification Kit. Note: In this process, we elute DNA fragment with 30 μl of Nuclease-free Water (8 μl aliquots of the eluent are used as a template DNA for following in vitro transcription). Prepare the in vitro transcription mix. Incubate at 37 °C, 4 h.
Add 2 μl of TURBO DNase (a component of MEGAScript) to digest the rest template DNA and incubate 15 min at 37 °C on the block incubator. RNA extraction with lithium chloride (LiCl) precipitation. Add 30 μl of nuclease-free water and 30 μl of LiCl precipitation solution to the in vitro transcription products. Mix thoroughly with vortex mixer. Chill for 1 h at -20 °C. Centrifuge at 4 °C for 15 min at 15,000 rpm. Discard the supernatants, and wash the pellet with 1 ml of 80% ethanol. Discard the supernatants, and dry the pellet with centrifugal concentrator CC105 for 5 min. Resuspend the RNA in 20 μl of Nuclease-free Water, and stored at -80 °C. Add m7G cap, or m7G cap and 2’-O methylation to the in vitro-transcribed RNA with ScriptCap system. Adjust the volume of transcribed RNA (50 μg) to 67 μl with Nuclease-free Water. Denature the RNA at 65 °C for 10 min, then transfer the tube immediately to ice. While the RNA is denaturing, mix following components. Add 4 μl of ScriptCap Capping Enzyme (10 U/μl) and 67 μl of denatured RNA to the reaction cocktail from step C1c. Incubate at 37 °C for 2 h.
Reaction products were purified with an RNeasy Mini Kit. Seed a 35 mm diameter dish with 2 x 105 mouse embryonic fibroblasts in 1 ml DMEM, and incubate 24 h.
Transfect RNA using Lipofectamine 2000. Dilute 10 μl of Lipofectamine 2000 DNA Transfection Reagent in 240 μl of Opti-MEM medium per sample. Dilute 2 μg of luciferase RNA in 250 μl of Opti-MEM medium. Add 250 μl of diluted Lipofectamine 2000 DNA Transfection Reagent to 250 μl of diluted Luciferase RNA. Mix thoroughly. Add RNA-lipid complex to the mouse embryonic fibroblasts, and incubate for 6 h.
After incubation for 6 h, wash the RNA-transfected mouse embryonic fibroblasts with D-PBS(-) twice. Add 100 μl of 1x passive lysis buffer and harvest cells with cell scraper. Determine the protein concentration in 5 μl aliquots of the supernatants by BCA Protein Assay. Add equal protein amount (determined by BCA protein assay) of aliquots of the supernatants to 50 μl of Luciferase Assay Reagent II (LAR II). Immediately, measure the relative luciferase units (RLUs) on Lumat LB 9507 Luminometer according to the manufacturer’s instruction. Figure 1. Luciferase activity of introduced RNAs. Wild-type and Ifit1-deficient (Ifit1-/-) mouse embryonic fibroblasts were transiently transfected with three different types of luciferase mRNAs (5’-uncapped, 5’ capped but 2’-O unmethylated; 5’ cap+/2’-O Me-, 5’ capped and 2’-O methylated; 5’ cap+/2’-O Me+). Luciferase activities are shown as relative light units (RLU), and the numbers of RLU were normalized by the concentrations of proteins determined in step E1d. Data are shown as means ± SDs of triplicate samples. 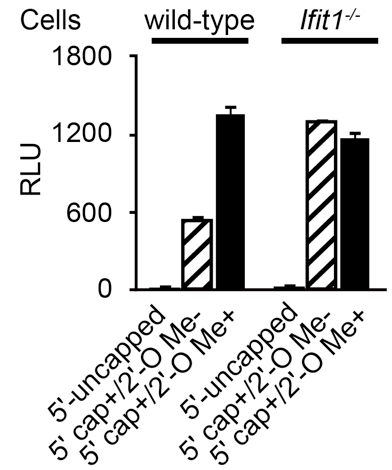 These data show that Ifit1 selectively inhibits the translation of 5’ capped but 2’-O unmethylated (5’ cap+/2’-O Me-) luciferase mRNA. This work was adapted from the following paper: Kimura et al. (2013). This work was supported by grants from the Ministry of Education, Culture, Sports, Science and Technology, the Japan Science and Technology Agency, and by the Ministry of Health, Labour and Welfare. Kimura, T., Katoh, H., Kayama, H., Saiga, H., Okuyama, M., Okamoto, T., Umemoto, E., Matsuura, Y., Yamamoto, M. and Takeda, K. (2013). Ifit1 inhibits Japanese encephalitis virus replication through binding to 5′ capped 2′-O unmethylated RNA. J Virol 87(18): 9997-10003. How to cite: Kimura, T. and Takeda, K. (2014). Cellular Translational Reporter Assay. Bio-protocol 4(6): e1068. DOI: 10.21769/BioProtoc.1068.